Story of a brave, little dog, fighting cancer on 3 legs. Hello, Lily here. I haven't posted for a while, mainly because there wasn't a lot to tell. Overall, I feel pretty darn good for a 3-legged dog with cancer. I don't have a lot of unpleasant side effects from the chemo so far. However, today I had the "big chemo" treatment where my mom and dad had to leave me so I could be monitored during the treatment. 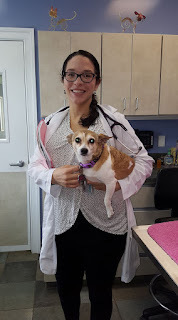 My wonderful Dr. Torres, assured my pawrents that I will have some poops and upset tummy problems within 48 hours and they could last a few days. I'm really hoping that isn't the case, as is my momma and especially my dad. He isn't a fan of cleaning up poop and puke. One of the positive side effects, if you can call it that, is that the prednisone makes me super hungry. I want to eat All.The.Time. And I figured out that if I just stand there and keep barking, someone will give me food. My fursisters don't get this luxury treatment (ha ha). I have really got my pawrents trained! The problem I've had with my chemo is that my white blood count goes pretty low and it delays some of my chemo treatments. That has allowed some of my lymphoma bumps to return, which worries my pawrents. We were all very happy that I was able to actually get the chemo today. We gotta kick cancers a$$. My pawrents go out of their way to make sure that I get outside more often on walks and they take me more places - just cuz. But they bring my fursisters and sometimes they just annoy me. Especially Annie...she's so hyper. Mavis is pretty chill, so she doesn't get on my nerves as bad. I have lots of chemo left - so keep up the good thoughts and prayers. Here is a picture of me and my sweet Dr. Torres from this morning. I love all the people at Veterinary Internal Medicine. They treat me so good! If you are sick...you should go there. Tomorrow, I go see Dr. Verna for some chiropractic work and a refill on my chinese herbals, which also help fight the cancer. Hoping that the tummy issues are not too bad! We are all on your team Miss Lily!!! Praying and holding you close in our hearts!!! Let's kick cancer's a$$! Nasty old disease!!! Love you and your pawrents are awesome!! !